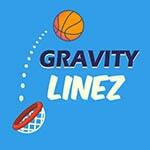 Draw a line in Gravity Linez so that the basketball can successfully hit the ring. If necessary, you can draw additional lines, but their number is limited. Beware of explosive bombs!